The job market is bad; embroidery is good. According to a new study from Georgetown University, the outlook for recent journalism graduates is bleak. The school looked at unemployment rates for a variety of recent college grads and graduate degree holders and found mostly good news. The cheer did not carry over to journalism majors. 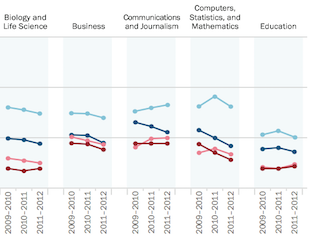 The unemployment rates of architecture, social science, education and law grads are all declining, while the unemployment rates for communication and journalism majors are increasing. In fact, among all the areas the study analyzed, comm and journalism was the only one that consistently posted higher unemployment rates. For those of you who are journalism students, now is not the time to look up how much you owe on your loans.